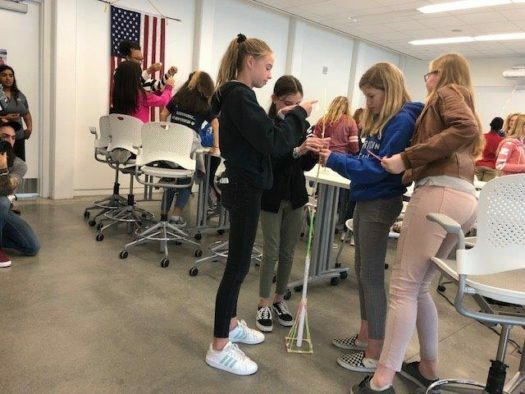 LCS RISE students had the opportunity to attend the International Women and Girls in Science Day at Florida Polytechnic University. Polytechnic hosted this event to celebrate the International Day of Women and Girls in Science, Monday, Feb. 11, at the Innovation, Science, and Technology Building on their campus. Florida Poly faculty, staff and students hosted several area middle school students, and the daylong program included presentations from female engineers employed at Walt Disney World, Duke Energy, and Polk County along with a science, technology, engineering, and mathematics (STEM) outreach activity. The RISE students took part in an engineering design which challenged them to build a tower out of straws, paper and masking tape that would hold up to winds but could maintain stability as it grew in height. It was presented as a competition and RISE rose to the occasion taking first place in tallest tower measuring 64 inches tall.